WHAT IS YOUR NEW YEARS RESOLUTION FOR 2014? I don't know about you but time is flying by at a record speed. I've started my New Year's resolution list for 2014. Some are a carry over from 2013 – does this sound like you? 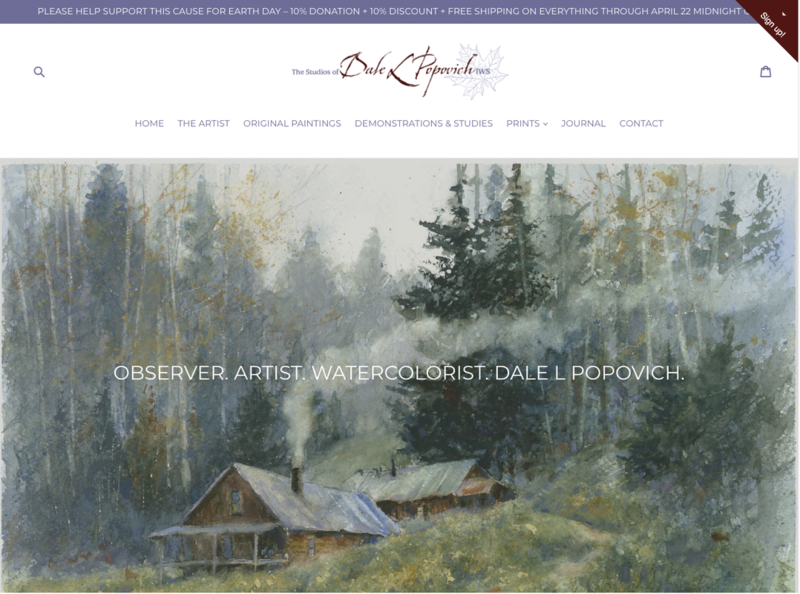 Maybe you have wanted to fine-tune your drawing and painting skills? Well here's a thought. Sign-up for Bob Krajecki and my next Fundamentals of Drawing & Painting session at the Palette & Chisel of Fine Art in Chicago, IL. Click on image for a pdf of the flyer. Need a gift idea for a special and unique holiday gift? What about giving the gift of creativity. 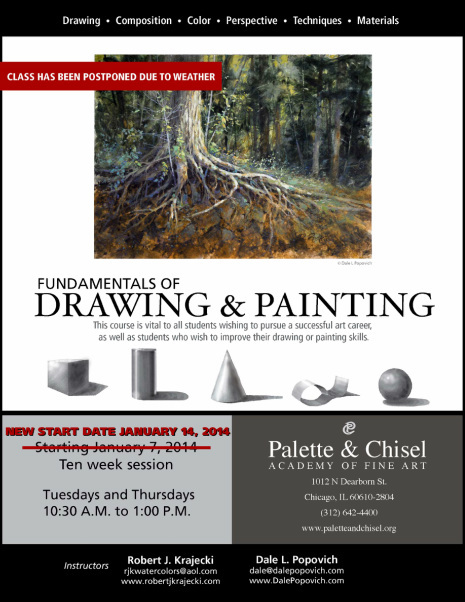 Bob Krajecki and I are offering Gift Certificates for their Palette & Chisel classes this year. 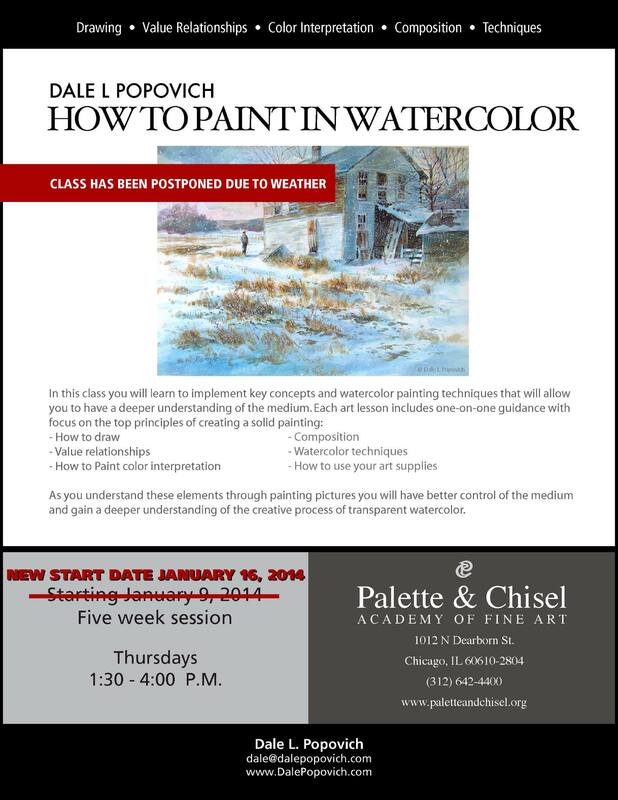 2013 Classes at the Palette & Chisel concluded on December 5th. As always I enjoy the variety of students attending my classes. I want to thank all my students for attending this year. Have a safe and happy holiday. See you in 2014. 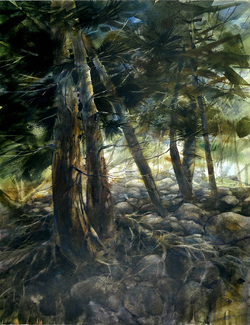 As you understand these elements through painting pictures, you will have better control of the medium and gain a deeper understanding of the creative process of transparent watercolor painting. Due to limited classroom space, this class is limited to 16 students. To reserve a place in the class, tuition must be paid in full. 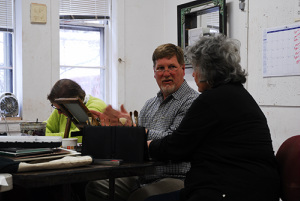 This class meets in our ground floor studio in the coach house. 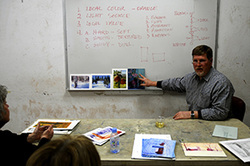 Each five-week session starts with a lecture and demonstration. And again a demo on the fourth week. If you are a beginner to this class you need not buy all the paints on the supply list for the first or second week - just purchase Windsor Blue or Thalo Blue.